Newbery Award–winning author Marguerite Henry’s beloved novel about a boy who would do anything to paint is now available in a collectible hardcover gift edition. Benjamin West was born with an extraordinary gift—the gift of creating paintings of people, animals, and landscapes so true to life they “took one’s breath away.” But Benjamin is part of a deeply religious Quaker family, and Quaker beliefs forbid the creation of images. Because Benjamin’s family didn’t approve of his art, he had to make his own painting supplies. The local Native Americans taught him how to mix paints from earth, clay, and plants. And his cat, Grimalkin, sacrificed hair from his tail for Ben’s brushes. 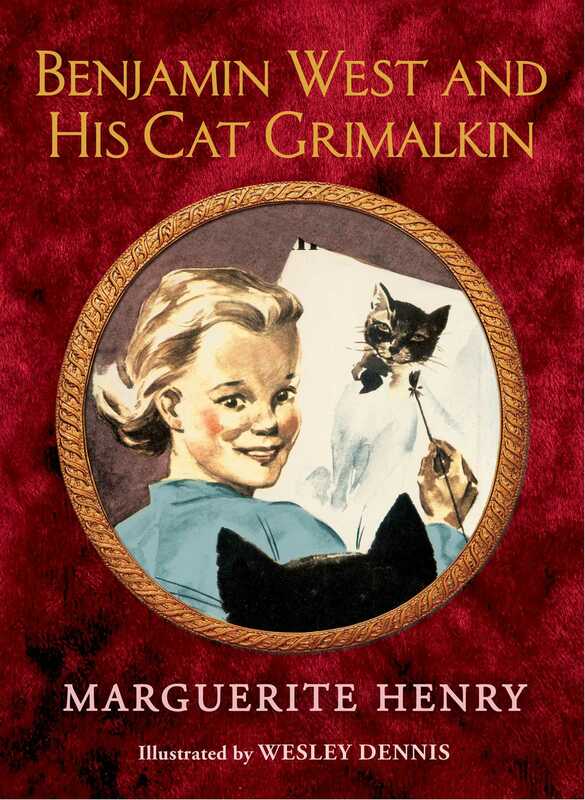 This classic story from Newbery Award–winning author Marguerite Henry features the original text and illustrations in a gorgeous collectible hardcover edition. Benjamin woke with a jerk. He held his breath, trying to separate the sounds that came floating up from the innyard. Usually he slept through noises. Travelers could lift the latch, help themselves to the snack of food set out for them, warm themselves by the fire, and leave without his so much as hearing them. But tonight there was a small sound that he could not make out. In a moment everything went quiet. Papa’s hound dogs stopped yapping. The rumble of cart wheels died. It was like the stillness that often comes in the middle of a storm. Benjamin raised himself up on one elbow. He wished he had ears like a horse so that he could swivel them around to catch the tiniest sound. There! The little noise came again. It was not the trembling cry of a screech owl. It was not the creaking of the inn signboard, or the frightening howl of a wolf. It sounded more like a boy. In a flash Benjamin’s bare feet were on the stool that acted as a mounting block for his high bed. Soundlessly he dropped to the floor and hurried over to the tiny square window. He threw open the shutters and poked his head out into the frosty November night. The courtyard, spread out below him, was washed in moonlight. He could see a man leading two scrawny oxen to the shed. He could make out the figures of a woman and a boy on the seat of the oxcart. Suddenly the boy bent over something in his lap and let out a dry sob. Benjamin tore off his nightshirt. His clothes lay heaped on a bench in a white patch of moonlight. Quickly he slipped into his leather jerkin and knee breeches. How cold they felt! Perhaps the boy was crying because he was cold. But no, figured Benjamin, as he pulled on his hand-knit stockings and hobnail shoes, it took more than cold to make a boy cry like that. Shivering, he lifted the latch and tiptoed out into the hall. “Papa!” he cried, as he collided with Mr. West, who was walking briskly toward him with a candle in his hand. Benjamin tried to straighten the candle which he had tipped at a crazy angle. He daubed at the hot tallow which had spilled down Mr. West’s coat. Then he looked up at his father and, frightened as he was, he wanted to laugh. In the long shadows made by the candle, his father looked exactly like the scarecrow in Mamma’s kitchen garden. The scarecrow wore a sober Quaker jacket and a white nightcap to frighten the crows. And here was Mr. West dressed like the sober Quaker he was, except for a white nightcap perched on his head. But even with his nightcap on, Papa looked forbidding. Benjamin followed the black coattails of his father as they flapped down the narrow, winding stairway. At the foot of the stairs Mr. West lighted the lanthorn that hung on an iron hook. Then he pinched out his candle, and set it on the candle shelf. Benjamin cast a quick glance around the kitchen. Two Indians lay wrapped in blankets on the floor, their feet to the fire. They grunted in their sleep, then drew their heads into their blankets, like turtles drawing into their shells. Benjamin and his father singled out their own black hats from the long row that hung on pegs near the door. Then they went out into the night. In the bright moonlight they saw the boy seated on the upping block used in mounting horses. His parents hovered over him like anxious birds. “Welcome to Door-Latch Inn in the County of Chester in the Province of Pennsylvania!” spoke Papa in a voice so big it rattled the windows. The little family started at the sound. Papa nodded. Then he pointed to the boy who sat on the upping block, rocking back and forth, holding something tightly in his arms. Jacob turned to Benjamin for help. In an instant, Benjamin was on his knees, peering into Jacob’s arms. And there, lying limp and motionless, was a tiny black kitten. Benjamin listened to its harsh breathing. Then he felt the kitten’s nose. “As hot as an ember,” he whispered to Jacob. Benjamin longed to tug at his father’s coattails. What kind of way was this to save a sick kitten? Why did grownups waste so much time in talk? The German parents were too tired and cold to do any more talking. All they wanted was a place to lay their heads. Benjamin could stand the delay no longer. Benjamin’s heart leaped. He suddenly felt as important as Dr. Moris. He could almost feel Dr. Moris’ big red bush wig upon his head. But he was glad he was still a boy. He could run! He ran now across the courtyard and the barnyard, around the worn path to the cellar. He lifted the heavy trapdoor and clattered down the cobblestone steps, his lanthorn making long shadows on the wall. He made his way past barrels of sweet-smelling apples without even stopping to fill his pockets. The milk crock was full. The good yellow cream had risen to the top. Carefully he ladled it into a tiny jug. Then he hurried into the kitchen. It was bright with firelight now, and a kettle was singing over the fire. Mamma was up, pouring hot water into the teapot, spreading rye-an’-Injun bread with rich brown apple butter, saying a quiet word to comfort the little German family, who sat in a row on the hooded settle. Benjamin glanced at the kitten. It was still breathing. He placed the jug of cream in a little nook in the chimney. “It will soon be warm,” he said to Jacob, and smiled a little smile of encouragement. Then he took the rush basket used for gathering eggs and in no time at all he was in the barn, reaching into the haymow for Elmira and one of her kittens. Elmira struggled, but Benjamin held her and her kitten firmly in the basket. All the while he talked in a soft voice. “I’ll bring thee back to the rest of thy family soon,” he promised. Then he hurried back to the inn, balancing the basket as carefully as if it held new-laid eggs. Gently the boy laid his kitten alongside Elmira’s kitten. Then Benjamin set the basket on the floor close to the warmth of the fire. The room turned quiet. All eyes were on the basket. Not a word was said. Only the fire whistled up the chimney, and the Indians grunted in their sleep. For two or three seconds the barn cat stared at the strange kitten. Then she sniffed it curiously. Her nose wrinkled. The fur flew up on her back. Her tail stiffened. “P-h-h-f-t! Sp-f-f-t!” she spat at him. Suddenly, she turned to her own kitten and began washing its face. Benjamin said a quick prayer under his breath. Please, God, make Elmira be a mother to the sick kitten. Then in case his prayer might not be answered at once he tiptoed around the chimney and reached up for the jug of cream. Benjamin was so startled at hearing his father’s voice that he upset the jug. And “Ach!” echoed Jacob as the cream spilled over into the basket, right on top of his kitten. Now it so happened that Elmira had been raised on skimmed milk. And when she saw the thick yellow cream dripping into the basket, she began licking it from the black kitten’s coat. Up and down went Elmira’s head as her pink tongue licked every bit of the rich cream from the kitten’s back. And then the strangest thing happened. When all the cream was gone, she kept right on licking. She kept right on stroking the sick kitten with her rough, warm tongue. Benjamin glanced sidelong at the boy. He laughed out for joy. Papa clicked his tongue in amazement. The kitten was stirring ever so slightly. He was stretching! He was letting out a hungry mewing sound. Now Elmira was lying on her side, nosing the black kitten and wriggling up to him. After what seemed a long time, but actually was only a matter of seconds, the black kitten began to nuzzle along the barn cat’s belly. And at last he and the white kitten were nursing side by side! A good feeling came over the whole room. Elmira purred until she sounded like a spinning wheel. Then she looked up at the anxious watchers with a pleased smirk on her face. “Ai yai yai!” choked Mr. Ditzler as he patted Jacob on the head. Even Papa seemed happy. He blew his nose as loud as a trumpet.